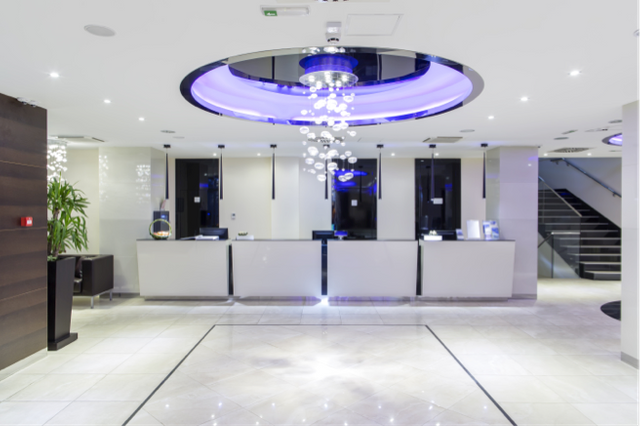 The design team at Octant has considerable experience in the design, engineering and manufacture of large-scale lighting features designed to add presence and drama to large volumes within buildings. Typically such spaces include entrance halls, atria and auditoria. Octant works closely with architectural design teams and structural engineers to evolve such features, which can be of any size and format. Often their form will have an empathy with, or cultural reference to, the space or building in question. The materials used within the features are all-encompassing, having used timbers, glasses, plastics, stones and metals with a plethora of finishes in previous projects. State of the art LED sources now offer not only excellent light quality at relatively low energy consumption but also the advantage of longer lifetimes reducing the need to re-lamp so frequently in positions that are difficult to access. It may be the feature is experiential, introducing movement, colour or dynamic lighting effects, either continuously or at specific moments in time. Even with such features, a budget is a key factor and Octant will provide an accurate budget figure from the outset of the project in order that the client can decide whether this is an avenue worth pursuing. Octant then works with the design team and client to ensure that this budget is adhered to. For further information or to discuss specific project requirements, please contact Mark Ayers on mark.ayers@octant-ld.com.